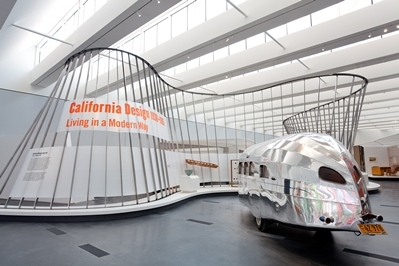 Check out "California Design 1930-1965: Living in a Modern Way"
1.) Hollywood Wilshire Boulevard Focus Weekend, featuring free admission at the A+D Museum, Hammer Museum, Craft and Folk Art Museum, MAK Center, Fowler Museum along Wilshire Boulevard as well as events at all the institutions. All revolve around the Getty’s epic Pacific Standard Time series of exhibitions. These include: A discussion called The Legacy of the California Design Exhibitions at LACMA; a talk with Deborah Sussman about Eames Designs at A+D; a panel about Mapping Another L.A.: The Chicano Art Movement at the Fowler, a discussion about Now Dig This! Art and Black Los Angeles 1960 – 1980 at the Hammer; and a about Sympathetic Seeing: Esther McCoy and the Heart of American Modernist Architecture and Design at the MAK Center. 2.) Launch of the exhibition, Architecture—A Woman’s Profession at WUHO Hollywood and a Saturday panel discussion at the MAK Center, moderated by AN‘s Sam Lubell and featuring author Tanja Kullack as well as Barbara Bestor, Monica Ponce de Leon, Dagmar Richter, and Ingalill Whlroos-Ritter. 3.) Inglewood Open Studios, featuring visits to the studios of more than 30 artists (and a few architects) in this emerging arts district, but showing off great arts spaces like the 32,400 square foot Beacon Arts Building.